Concerns about aging oil pipelines were heightened earlier this year after 100,000 gallons of oil spilled near Santa Barbara, coating 97 miles of the California shoreline. Environmental activists in the Midwest warn that the same thing could happen closer to home. There is only one pipeline that carries oil along the bottom of the Great Lakes. And that pipeline is only 4.5 miles long. But along that 4.5 miles lies the spot where Lake Michigan meets Lake Huron in the Straits of Mackinac. Environmentalists say there couldn't be a worse place for an oil spill to occur. Elizabeth Brackett has more. The air is crisp and the water is cool in the Northern Great Lakes, a body of water that contains 90 percent of the fresh water in the U.S. And it’s the reason nearly a million tourists visit Mackinac Island every year. But this year, islanders have more on their minds than tourists. Just north of the famed Mackinac Bridge, two aging pipelines carry 20 million gallons of crude oil and natural gas a day under the Straights of Mackinac. Longtime island resident and former biological sciences professor Lorna Straus worries about a possible pipeline break. Pipeline number five is owned by Enbridge Energy Pipeline number five is owned by Enbridge Energy. The Canadian oil company operates the largest crude oil and liquids pipeline system in the world. Line five is 645 miles long, stretching from Wisconsin across Michigan’s Upper and Lower Peninsulas to Ontario, Canada. The 30-inch pipeline splits into two 20-inch lines when it crosses 4.5 miles under the lake. Lake Michigan and Lake Huron join at the Straits of Mackinac. Because the area is far from any major urban center and the shoreline is lined with forest and not agriculture, very little pollution gets into the water. That means the waters are some of the most pristine in all of the Great Lakes. Some 30 million people depend on the Great Lakes for their drinking water. Enbridge spokesman Jason Manshum says that’s one of the reasons why the company works so hard to keep line five safe. It’s those 62 years under water for pipeline five that trouble retired DOW Chemical engineer Gary Street. Yet Manshum points to a 99.9993 percent success rate. “In the last decade [Enbridge] has safely transported more than 13 billion gallons of crude oil throughout the U.S. and Canada,” he said. But a National Wildlife Federation report found that Enbridge was responsible for more than 800 oil spills between 1999 and 2010. A map illustrates U.S. pipelines. Aging pipelines are a national concern: More than 5,000 spills in the 124,000 miles of pipeline were reported to the federal government over the last 15 years, including a major spill in Michigan. In July 2010, an Enbridge pipeline ruptured in the Kalamazoo River, dumping 1 million gallons of oil near Marshall, Mich.
Enbridge spent $1 billion and three years on cleanup, and the Environmental Protection Agency says oil still remains in the Kalamazoo. Environmental activist Jim Lively, of the Groundwork Center for Resilient Communities, says that was the spill that prompted concern about the safety of the Enbridge pipeline in the Straits of Mackinac. “Just weeks before that spill they said very much the same thing,” Lively says. “No concerns … this pipeline is very safe, and then it leaked – for 17 hours – over a million gallons into the Kalamazoo River. The largest inland oil spill in America happened right here in Michigan." Enbridge’s state-of-the-art control room. The pipeline in the Straits is now monitored with computerized systems that operate both inside and outside the pipeline. The findings are analyzed in Enbridge’s state-of-the-art control room that operates 24/7 in Edmonton, Canada. In addition, Manshum says that dive teams physically inspect the pipeline every other year. But underwater video tells a different story. The pipeline is now covered with invasive zebra mussels, which didn’t enter the Great Lakes until the 1980s. Street says these mussels create three problems. “They create extra weight on the pipeline, weight that was never allowed for in the design of the pipeline. They mask any problems from the outside that could be observed by a diver or by a remote camera; and the zebra mussels excrete a very acid material. If that acid material were to get behind the protective coating, it will cause corrosion and the line would fail prematurely,” he said. What nearly everyone up here agrees on – including Enbridge – is that an oil spill in these pristine waters would have a major impact. Ecologist Knute Nadelhoffer of the University of Michigan’s Biological Field Station, says the environmental impact of a spill could take years to overcome. As Margaret Doud, the mayor of Mackinac Island, gets ready to open her hotel for the season, it’s not the next decade or century she’s thinking about. It’s the impact of an oil spill right now. Enbridge insists a pipeline failure in the Straits would be detected almost immediately. The Mackinac Bridge. But Street thinks it’s not so simple. That’s why activists say the only sure way to avoid a possible environmental and economic disaster is to shut the pipeline down. Shutting down the pipeline is one of the options being considered by a pipeline task force chaired by Michigan’s attorney general. 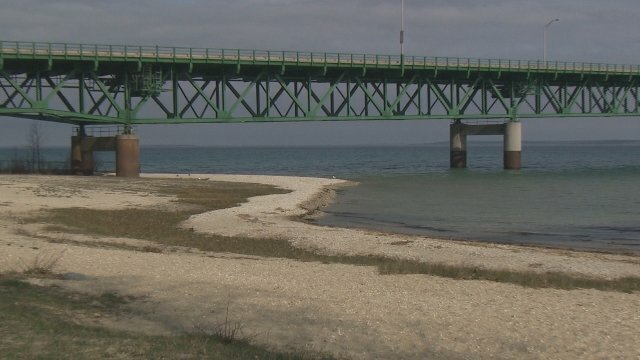 The commission will also look at the economic impact of shutting down the 4.5-mile stretch under the Straits of Mackinac. That task force report came out in July. Among the recommendations: Prevent the transport of heavy crude oil through the pipelines. Require an independent analysis of the risk the pipelines pose, as well as pipeline alternatives. The task force also recommends obtaining more information from Enbridge relating to the pipelines. But many environmentalists and others were disappointed the state didn't move to simply shut the pipeline down. You can read the full report here. Go here for additional documentation from the Michigan Department of Environmental Quality. The University of Michigan Water Center with support from the National Wildlife Federation created simulations illustrating what would happen if the pipeline leaked in the Straits of Mackinac. Watch the video, below. The University of Michigan Water Center with support from the National Wildlife Federation created simulations illustrating if the pipeline leaked in the Straits of Mackinac. Watch the video below.